Meringues can make a boring recipe very special whether it is a light crispy meringue or one with a soft toffee like centre. For some reason people become very daunted when faced with preparing and making meringues whereas they are quite simple to make and any mistake can be turned into delightful desserts. This recipe must be one of the easiest of ways to make meringues. There’s no whisking or careful measuring of ingredients and the cooking time is measured in seconds. Separate the yolk and whites of two eggs and place the whites into a clean bowl. Gradually add icing sugar until you have a very stiff mix and cannot add another ounce of the sugar. Break the mix into marble sized pieces and roll them in the palm of your hands (dust your hands in icing sugar so the mix does not stick). Experiment with the cooking time of your meringues to begin with until you have perfected the art. This mix makes many meringues so you can afford to waste a few. Place one ball into your microwave oven and turn onto full power for one minute and watch carefully. As soon as the meringue expands turn off the power and remove it from the oven. This can be fifteen seconds in some cases depending on the efficiency of your microwave appliance. Remember the meringue will be hot! Experiment with the number you cook at one time and perhaps with different sized pieces of the egg and sugar mix. It is surprising how many meringues you can make from such a small amount of ingredients. 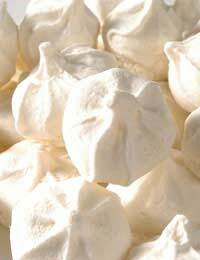 As with many foods cooked in microwave ovens the meringues will not be browned as they would on top of a lemon meringue pie or other desserts. To add a colour place several drips of food colouring into the egg white before adding the icing sugar so that it blends into the mixture evenly. You can also add a flavour to the mixture at the same time coffee or strawberry flavours are very popular. Unlike meringues made in the traditional way this recipe does not keep quite so well so use them on the day they are made. However the preparation time is only minutes so there is no need to have to make them in advance. Beat some double cream until it is thick and sandwich two of the meringues together. Add a topping to disguise any discolouration in the meringue. Melt a small bar of dark chocolate in the microwave and stir in two tablespoons of cream. Drizzle over the meringues and serve in colourful paper cake or muffin cases. Another tasty topping for meringues is a melted Mars Bar. Place the bar into the microwave and cook on high for several seconds until it has melted. Remove and mix well and pour over the meringues. This is also a tasty topping for ice cream. Eton Mess always looks such a grand dessert and can be made either with the meringues that were not successful or prepared especially for this dessert. Smash up the meringue and fold together with sliced raspberries or strawberries and double cream. Divide into sundae dishes. Drizzle a little fruit sauce over the top and served immediately – delicious!